Eastleigh end 2016 with three points with a 1-0 win away at Boreham Wood as Martin Allen earns his first league win as Spitfires boss. Scott Wilson scored the only goal in the 48th minute. Eastleigh: Mark Childs, Michael Green, Adam Dugdale, Tyler Garratt, Hakeem Odoffin, Bondz N'Gala, Ross Stearn (Ben Strevens, 79), Jai Reason (Connor Essam, 57), Sam Togwell, Scott Wilson (Ryan Bird, 62), James Constable. Subs: David Pipe, Mikael Mandron. Great Scott! 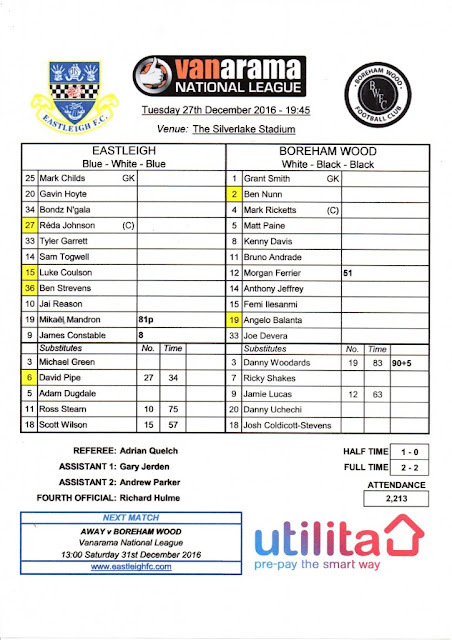 Allen gets his first league win as Eastleigh bossBoreham Wood 0 Eastleigh 1 EASTLEIGH have their first league victory under manager Martin Allen. The Spitfires atoned for conceding a late equaliser in Tuesday's 2-2 draw with Boreham Wood by edging the return match 1-0 at Meadow Park in today's 1pm kick-off. Eastleigh dealt another injury blow as defensive titan faces three weeks outEASTLEIGH'S injury jinx has struck again with defensive colossus Reda Johnson facing three weeks on the sidelines with a hamstring problem. Having limped out of Tuesday's 2-2 National League draw at home to Boreham Wood, the former Coventry City powerhouse not only misses Saturday's (1pm) return league fixture at Meadow Park but will leave a giant 6ft 3in hole in the side for the FA Cup third round tie at Brentford on January 7. FA Cup: Eastleigh target a sell-out for Brentford tieEASTLEIGH chairman Stewart Donald has been "stunned" by the fans' response to the FA Cup third round tie at Brentford on Saturday week. The Vanarama National League club have sold over 1,250 of their 1,650 allocated tickets for the trip to Griffin Park (January 7, 3pm). Eastleigh: Mark Childs, Gavin Hoyte, Tyler Garrett, Ben Strevens, Bondz N’Gala, Reda Johnson (David Pipe, 34), Jai Reason (Ross Stearn, 75), Sam Togwell, Mikael Mandron, James Constable, Luke Coulson (Scott Wilson, 57). Subs: (not used) Michael Green, Adam Dugdale. Eastleigh Football Club can confirm that Doncaster Rovers left-back Tyler Garrett will be joining the Club on loan from 27 December. The 20-year-old, who arrived at the Keepmoat Stadium from Bolton Wanderers in the summer, will remain with the Spitfires until January 28. Eastleigh Football Club is delighted to announce that former Republic of Ireland U21 goalkeeper Graham Stack will be joining the Club on 1 January as player/goalkeeping coach. Experienced ‘keeper Stack will join on an 18-month contract. Stack started his career at Arsenal and he made five appearances for The Gunners. In a career spanning almost 300 games so far, he has since represented Beveren (Belgium), Millwall, Reading, Leeds United, Wolverhampton Wanders, Plymouth Argyle, Blackpool, Hibernian, Barnet and Kerala Blasters (India). 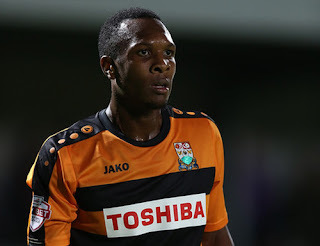 Stack made over 125 appearances for Barnet and helped them become National League Champions in 2015, working under our current Manager Martin Allen. Eastleigh swoop for stopper StackEastleigh have completed the signing of former Arsenal keeper Graham Stack. Nine-man Eastleigh suffer 4-3 National League defeat at SouthportEASTLEIGH'S first league game under Martin Allen ended in a dramatic 4-3 defeat at struggling Southport. Three players were sent off, including Joe Partington and new loan signing Hakeem Odoffin for the Spitfires. A frustrating afternoon ended with Eastleigh sitting 12th in the Vanarama National League, ten points behind fifth-placed Barrow and 17 shy of new leaders Lincoln City who beat Tranmere 2-1. Eastleigh Football Club is delighted to announce the signing of experienced midfielder Sam Togwell, 32, from Barnet FC. Sam joins on an 18-month contract for an undisclosed fee and is available for selection straight away. Togwell has vast experience in the football league, playing in excess of 200 matches. Having started his playing career at Crystal Palace, he has gone on to play for Barnsley, Scunthorpe and most recently Barnet. Having put pen to paper on an 18-month contract Sam was delighted: “I am pleased to be joining a club with plenty of ambition. "Also I am looking forward to working for a manager whom I enjoy working for and have had plenty of good times with. Eastleigh Football Club is delighted to announce the signing of Gavin Hoyte from Barnet FC on a free transfer. Hoyte is a full international for Trinidad & Tobago and the defender joins The Spitfires on an 18-month contract. The 26-year-old came through the ranks at Arsenal and made a handful of appearances for the first team. During his time with The Gunners he had loan spells at Watford, Brighton & Hove Albion, Lincoln City and AFC Wimbledon; before signing for Dagenham & Redbridge in 2012. In 2014 he joined Gillingham, leaving them after one full season to team up with Martin Allen at Barnet. London-born Hoyte represented England at U17, U18, U19 and U20 level. He is approaching 200 first team appearances across all four top divisions in England. Eastleigh Football Club is delighted to announce the loan signing of Hakeem Odoffin from Wolverhampton Wanderers. Hakeem started his youth career at Tottenham Hotspur. He joined Wolves in January 2016 after making the move from Barnet. Odoffin, who is 18, will link up with The Spitfires for a month. The move is subject to paperwork being completed. Eastleigh sign Wolves defender on loanMARTIN Allen has made his second signing as Eastleigh boss. After bringing 36-year-old midfielder Ben Strevens back to the Silverlake from Whitehawk, Allen has moved to the other end of the age scale to take 18-year-old defender Hakeem Odoffin on loan from Wolverhamtpon Wanderers. He will link up with the Spitfires for a month. Your #Spitfires XI for tonight's @EmiratesFACup replay against @FCHTOnline! 43' GOOOOOOOOOAL! @ScottWilson93 HAS IT! What a time to score! @JamesConstable9 put a teasing ball across the six-yard box - and Wilson couldn’t miss! Get in! Midfielder re-signs for EastleighEastleigh have re-signed midfielder Ben Strevens following Andy Drury's exit and a long-term injury to Jason Taylor. Drury made a shock return to Ebbsfleet shortly after Martin Allen was appointed as Eastleigh manager, while Taylor is in need of a hip operation. Martin Allen will look to involve a number of youth players for Eastleigh's FA Trophy fixture away at Harlow Town in the first round on Saturday. Midfielder Jason Taylor is out for potentially two months with a hip problem while Alefe Santos has ended his short loan spell with Eastleigh to return to Derby County. Goalkeeper Ryan Clarke is still out with an elbow injury and another big blow for the new Spitfires boss is losing skipper Ryan Cresswell for the season following a knee operation. A second string Eastleigh side lost 3-1 in the Hampshire Senior Cup against Gosport Borough on Tuesday night. Reflecting on the game, Allen commented: “With the team being so young, it got difficult for them to physically compete as the game progressed, but there are certainly ones to work with in the future. 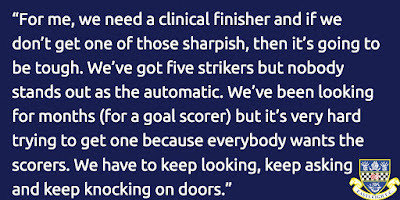 “It’s a bit of a fine balancing act at the moment with some of the younger players having to be fast-forwarded because of injuries and players being cup-tied. Derby County have exercised their recall option on the short-term loan deal for Alefe Santos. Alefe was restricted to six appearances, four of them as a substitute, during his twenty-eight day spell at the Silverlake Stadium. Santos returns to training with Derby County on Friday. Eastleigh Football Club would like to thank Derby County manager Steve McClaren for his assistance in this loan arrangement. FC Halifax and Eastleigh have been drawn away to Brentford in the 3rd Round of the FA Cup. The winners from the 2nd round replay between the Spitfires and Halifax, will come up against Championship side Brentford in the next round. Brentford are currently 18th in the Championship. 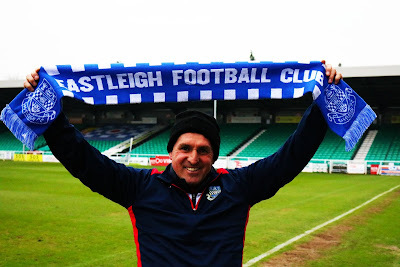 Eastleigh will first have to win in their replay having drawn 3-3 to Halifax in Martin Allen's first game in charge. The replay will take place on Tuesday 13th December at the Shay with a 7:45pm kick off. Having been 3-1 down, Eastleigh managed to rally and level the tie at the Silverlake Stadium thanks to goals from Scott Wilson and a dramatic late equaliser from Mikael Mandron. 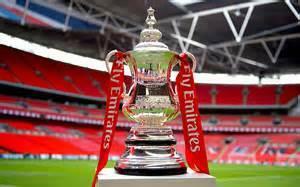 The FA Cup 3rd Round ties are due to be played between the 6th and 9th January 2017. New Eastleigh boss Martin Allen is on the lookout to bolster his midfield options following Andy Drury's departure to Ebbsfleet and an injury to Jason Taylor. “He (Andy Drury) was honest and said he didn’t want to play down here anymore. “I let the chairman know and thought it was best all-round to let him leave. “We need everyone fully committed and I respect his decision and his choice. “He’s a good player, any club would miss him at this level. “But credit to the chairman, he let him go for nothing." Midfielder Jason Taylor is sidelined with an injury and Allen is hoping to boost the numbers in midfield where he feels the squad is a little short. “Jason had an injection on Thursday to be able to play in this game but was injured after 20 minutes and couldn’t run. “He took one on the bottom of his foot but his hip was already a problem and he’s likely to need an operation. Eastleigh had to fight back from 3-1 down to earn a dramatic 3-3 draw in the FA Cup in new boss Martin Allen's first game as Spitfires manager. Mikael Mandron had put the hosts 1-0 up in the first half but the visitors came out fighting after the break and scored three goals in the space of just 11 minutes. Eastleigh pulled a goal back through substitute Scott Wilson who set up an exciting finale when he fired home to make it 3-2 in the 74th minute. The drama didn't end there as Mandron ensured Eastleigh still had a place in the competition by scoring a late leveller with his second and Eastleigh's third goal of the game to make it 3-3. Eastleigh will now travel to Halifax Town for the replay looking to settle the tie on Tuesday 13th December. The FA Cup 3rd round draw will take place on Monday. Lloyd Lampard has enjoyed following the Spitfires for a while. 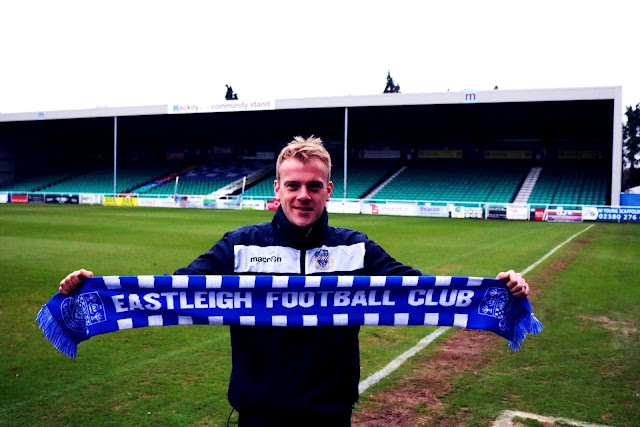 He says: “I think Eastleigh are a great club. They may not be in League Two or League One, but they have a sense of spirit that follows them. Lloyd enjoys the experience and atmosphere when following Eastleigh games. “I think the atmosphere for fans is amazing. Following Ronnie Moore’s recent and somewhat unexpected departure from the Silverlake Stadium, Lloyd offers his views on Ronnie’s time at the club and wishes him well for the future. “I think the club is far from being the best but when Ronnie Moore was in charge, I used to love watching our home games because I knew that it would be special. “It’s a tough division to get out of, only two do, but to be champions is achievable this season. "You have to be pretty special to be a champion but we’re only halfway through. “The crunch time will come towards Easter. That’s when it’s really going to matter and when we find out what we’ve got. “We’ll see if the teams at the top now can handle the pressure of being at the top because it’s hard being at the top. "My Barnet team dealt with it because we were top of the league from the first game till the last game. “We’ve got to come from behind but we will put a run together and these players will challenge, there’s no doubt about that." Midfielder Andy Drury has left Eastleigh and signed for Ebbsfleet. A club statement read as follows: "Eastleigh FC can confirm that Andy Drury has left the club by mutual consent to be nearer to his family. "Drury joined Eastleigh in 2015 and made over 50 appearances for the Club. Amongst other things, he will be well remembered for his goal against Swindon in this season’s FA Cup 1st Round replay victory. "We wish him well for the future." James Russell joins Eastleigh as assistant manager following the appointment of Martin Allen. The new Spitfires boss said: “James has joined this morning, he has a Masters degree in sports science and has worked with me at Notts County, Gillingham and Barnet. "He was a champion at Gillingham so he’s got that gold medal and has been with me at Barnet since the beginning of season. “He is here to help, support and look after me and the players. James knows how I work, what I want and my attention to detail. Eastleigh take on FC Halifax Town at the Silverlake Stadium in the FA Cup second round on Sunday for what will be Allen’s first game in charge. 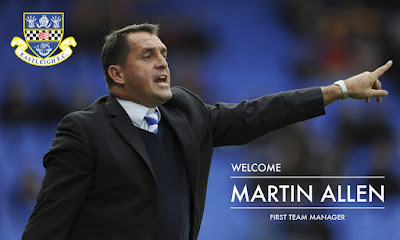 "Eastleigh Football Club is delighted to announce the appointment of Martin Allen as its new first team Manager. Allen takes charge with immediate effect and will be in the dugout for Sunday’s FA Cup Second Round tie against F.C Halifax Town. "The 51-year-old makes the switch to the Silverlake Stadium following a successful spell with Division Two Barnet, whom he guided to the Football Conference (now National League) title in 2014/15. "The appointment of the vastly-experienced Allen signifies the club’s intent to continue its progression over recent years. "A combative midfielder, Allen played top-level football for Queens Park Rangers and West Ham United; and also had playing spells at Portsmouth and Southend United. A statement on Barnet FC's website confirms that manager Martin Allen is set to become the new Eastleigh manager following the departure of Ronnie Moore. 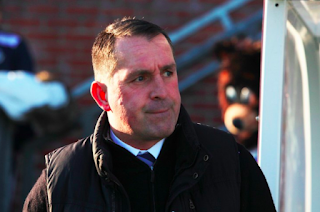 "Barnet Football Club can confirm first-team head coach Martin Allen has been released from his contract to enable him to join Vanarama National League side Eastleigh. "Martin leaves Barnet having helped guide the Bees back into the Football League in 2015 – a record-breaking third Conference title for the club. "Barnet Chairman Tony Kleanthous said: “Martin has asked to be released from his contract so he can join Eastleigh. "“The approach came out of the blue yesterday but it was quite clear that Martin had decided that he wanted to take the opportunity they were offering to him." Ronnie Moore has left Eastleigh after just three months and 21 games in charge. "The club would like to announce that due to personal circumstances over the past few weeks the club have agreed to terminate Ronnie Moore’s contract with immediate effect.